When someone breaks wind it's only natural to plug your nose and cover your mouth, but this mythical fart will leave you gulping instead of gasping. 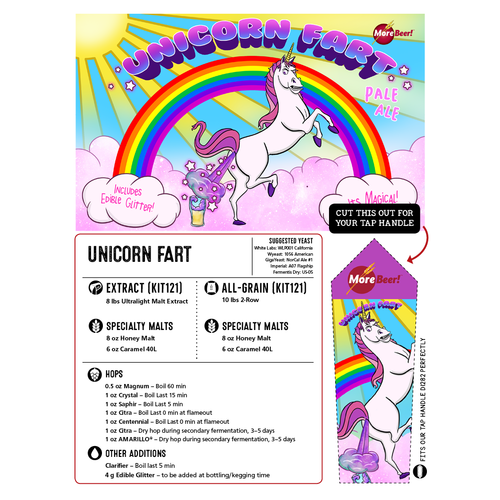 With a simple malt bill and long list of citrusy hop additions, Unicorn Fart Pale Ale is as light-bodied as a cloud, with flavors as bright and vibrant as a rainbow. Oh, and it SPARKLES! Each kit comes with a small jar of food-grade edible glitter that will surely set it apart from anything you've ever brewed. 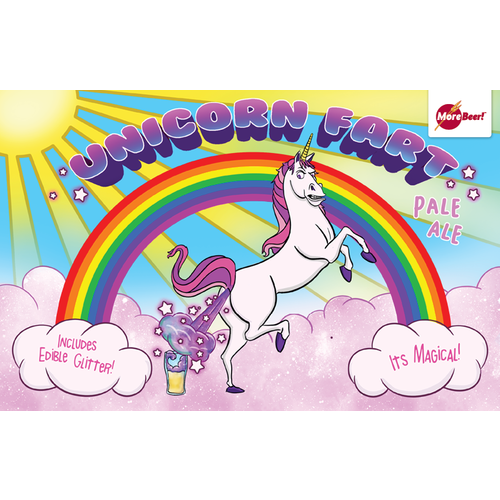 Lure in curious beer lovers (or even some magical beasts) with the eye-popping presentation of Unicorn Fart Pale Ale. They won't regret coming close enough to take a whiff. unique kit. never seen one like it before. Edible glitter...... had to try this. How easy is it to remove the traces of glitter from the keg and beverage lines after this batch is done? When you keg it, does the glitter stay suspended in the keg, or does it drop to the bottom so that you have a ton of glitter in the first few pours? BEST ANSWER: We recommend that the keg be roused prior to use. I kept occasionally swirling the bottling bucket throughout the bottling process in hopes to have kept the glitter evenly distributed. I cracked my first couple of these open yesterday, and the beer is FANTASTIC. I think i did the best i could in keeping the glitter dispersed, and think it worked. 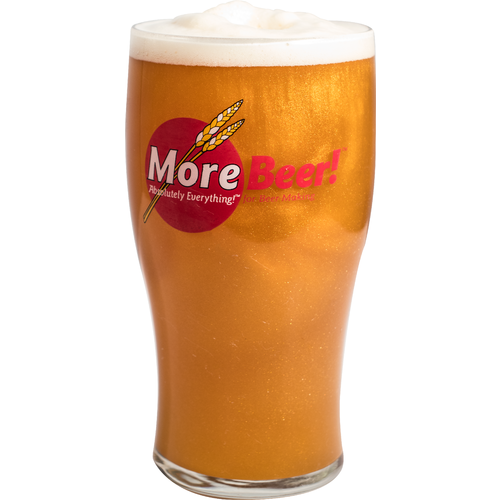 i can totally see how the glitter would settle in bottom of kegs, as i did a swirl of the bottle with about a third left to get it into the glass. I will make the recipe again, but probably won't use the glitter next time so i can keg it. Great kit and fantastic finished product!! Neat concept but failure in execution. Beer has good flavor at bottling but the glitter all settled to the bottom. I had sludge in my bottling bucket and apparently none in the bottles. There's has to be a better way. I suspect that a different glitter with nuetral density needs to be developed. The beer was a hit taste wise at party. The glitter not as much. In the back of my head I knew I should have bottled the beer but I kegged it anyways. Even with swirling the keg between pours the glitter was gone after 8-10 glasses. If I try it again I will definitely bottle.